The symptoms seem more severe when travelling eastwards rather than westwards and when the distance travelled is longer. It also seems to affect older people more severely than younger people. The symptoms appear to be due to a temporary dissociation between the body's internal clock and the environmental 'clock'. As described in previous sections, it seems that it is the daily cycle of melatonin, from the pineal gland, that sets up the daily cycles of many other hormones and physiological functions. Light through the eyes acting on the pineal then acts to synchronise the internal rhythm with the light/dark cycle of the environment, making us alert during the day and sleepy at night. This transient loss of synchrony means that peak alertness, as determined by the physiology of the person, does not occur at the same time as demanded by the environment. Sufferers are therefore sleepy in the day and less tired at night. 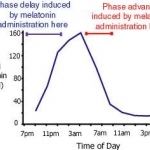 The diagram below shows how the melatonin circadian rhythm is affected. delayed (i.e. reset backwards) by administration 8-13 hours before the melatonin peak. This is illustrated in the diagram. Administration outside of these times has no effect. Results of studies examining the effect of melatonin administration on jet lag symptoms are unfortunately conflicting. Some show that regimes can promote resynchrony of circadian rhythms is hormone levels, temperature and electrolyte levels, but not of sleep patterns, the latter being most important in jet lag. Other studies show no effect at all. Overall there does seem to be a beneficial effect in subjectively reported symptoms of jet lag in about 50% of people who follow the programmes. 1) When travelling westwards, effectively moving back into earlier time zones, a phase delay is induced by administering melatonin before the normal peak (e.g. in the late evening). To be precise the timing of administration would be an hour later (for phase advancing) or earlier (for phase delaying) for each hour further eastward or westward travelled. At the present time much more research needs to be done in this area on many more people. 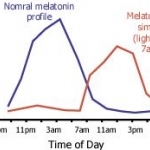 Very little is known about the dose levels and long-term side effects of melatonin, although so far no serious adverse effects have been reported. Time will tell as to whether melatonin will prove to be useful in this area and whether indeed disruptions to melatonin levels are in fact the cause of jet lag.